CATS Modal integrates all the functionality of STAR Modal into our Computer-Aided-Test-Suite of applications, combining acquisition with analysis for unparalled power and efficiency. Integrated data acquisition makes acquiring and managing large sets of modal data easier than ever. Automated management of measurement DOF simplifies data acquisition for multiple data sets and reduces test time. A built-in signal generator provides user-specified excitation type (random, sine, chirp, burst random, user-defined) and amplitude control.Upgrading to Premier Modal Data Acquisition adds the ability to acquire multiple-input, multiple-output (MIMO) modal data. For acquisition of long time history events, the optional removable SCSI throughput disk provides simultaneous acquisition of time data to disk for up to 128 input channels at up to 51.2 kHz sample rate per channel. 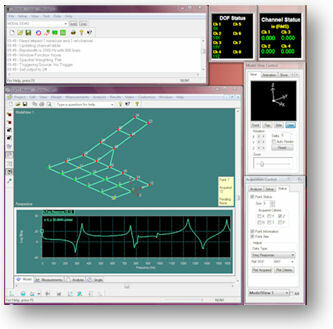 The optional Virtual Calculator can even provide math processing of live data streams and stored data files for complete flexibility in signal processing.Optional modules for Transient Analysis (SRS) and Swept Sine Analysis give CATS extremely powerful and versatile signal analysis capabilities.